Current is the rate of flow of charge. Ammeter must be connected in series in a circuit. After connecting the ammeter to the circuit, if the needle deflects to the left side of zero mark, simply interchange the connections on the terminal of the ammeter. An ideal ammeter has negligible resistance. Direction of current flow is from positive terminal to negative terminal. It is also known as conventional current flow. 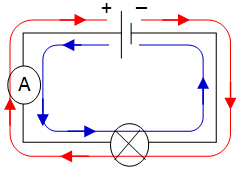 ﻿Electron flow﻿ is opposite to conventional current flow. It is from ﻿negative terminal to positive terminal. When we talk about the direction of current, we mean the conventional current flow (from positive to negative terminal). There is a current ONLY when the circuit is completed!